Free or Premium WordPress Themes: What Should Your Choice Be? There’s an almost overwhelming choice of WordPress themes available, and that’s before you decide whether to choose free or premium WordPress themes. Premium WordPress themes tend to seduce us with their sleek appearances and rich features, whereas free solutions are forever tempting the bargain hunter within us all. When it comes to the crunch, you could potentially be left chasing your tail. To avoid confusion when considering free or premium WordPress themes, it’s vital you arm yourself with the necessary knowledge and weigh up the pros and cons of each option, in order to make an informed decision. The question is simple: free or premium WordPress themes? As you’re about to discover, the answer doesn’t have to be too challenging. 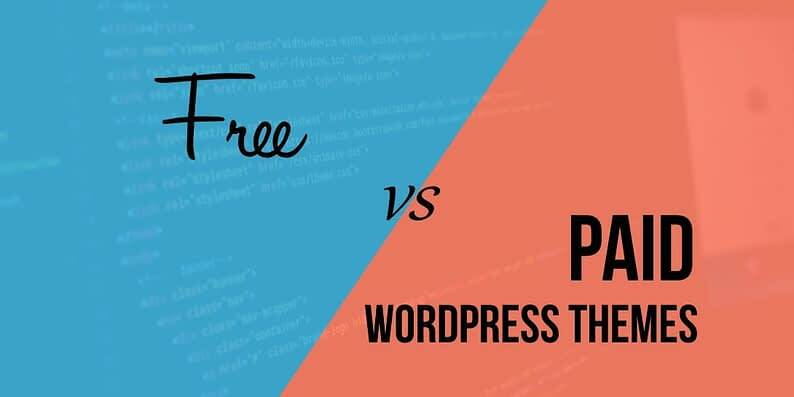 In this post, we’ll highlight some key differences between free and premium WordPress themes, so you can fully evaluate both options for yourself before making a choice. Free themes are typically produced by independent developers, with limited or no support – although high-end vendors also provide free themes on occasion, as a tempter for their premium offerings. However, due to their lack of cost, the quality and customization options can vary greatly, and they rarely reach the benchmark set by premium themes. Premium themes typically cost money for good reason. They should be feature-rich, responsive, and well supported by the vendor’s support staff. We say should be, because that’s not always the case. However, as a rule of thumb, you can expect a higher level of quality throughout from premium themes when compared with their free counterparts. Totally free, with no strings attached. Generally reasonably priced, considering the extensive benefits listed below. Themes downloaded from the official WordPress.org theme directory will have undergone an official review process. Not required to undergo an official review process before hitting the market. Will typically have a minimal number of features, which in turn should make them leaner and therefore quicker to load – thus boosting the speed of your website. Generally speaking, the overall build quality is far superior. This may even cancel out the ‘quick and lean’ nature of free themes, as a premium option may be designed with speed in mind, despite its feature richness. Rarely come bundled with documentation, and support can be limited. The vendor should provide excellent support, along with documentation to guide you through the setup process. Usually lack in-depth customization options; you may need some coding knowledge to get the best out of it. Typically comes with more features out of the box, including greater customization options and third-party app integrations to extend your website’s functionality. Although more features is often a good thing, some premium themes suffer from ‘theme bloat’. This is essentially a theme so packed with features that it affects loading speed, and could deliver functionality that nobody will ever use to its fullest. Updates can be few and far between (or never at all). Over time, this could lead to security vulnerabilities. You can typically rely on a far more regular update cycle to keep your theme secure. However, there is always the danger that a theme vendor will discontinue a product, leaving you with the same long-term security vulnerabilities as any free WordPress theme. Browsing and installing free themes are easier given the access to the theme directory from your WordPress dashboard. Available from a wide range of independent theme shops and marketplaces. Just a tip, our own theme library is stocked with a selection of both free and premium WordPress themes, making it a good place to compare and contrast the two options before making your final call. Free or premium: what should your WordPress theme choice be? When it comes to choosing between free or premium WordPress themes, it’s ultimately up to you – there is no ‘best’ option across the board. That being said, we believe that the benefits of choosing a premium theme far outweigh those of a free theme. Therefore, we recommend you plump for a premium option if you can afford to do so. Furthermore, by buying a premium WordPress theme, you’re directly supporting the WordPress developer community. Spending your money in this way ensures the community’s growth, which means more awesome themes and plugins will be built in the future. For some further advice on how to spot great free or premium WordPress themes, check out this article from Smashing Magazine. When dealing with a fledgling project, the temptation to save money by opting for a free WordPress theme can be overwhelming. However, unless you’re truly cash strapped or have incredibly limited needs, we recommend opening your wallet and purchasing a high-quality premium theme instead. Free WordPress themes are indeed totally free, with no strings attached. The lack of features in free themes makes them lean, and therefore typically faster to load. Premium themes will come with far more functionality out of the box. Ongoing support and updates mean premium themes are more secure in the long run. Premium themes usually ship with plenty of back end customization options, so there’s rarely any need to delve into the code. So, what’s your final decision: free or premium WordPress themes? Share your views with us in the comments section below!